Home > Personal Details > What are Biometric Passports? With so much emphasis on identity theft and also the introduction of illegal immigrants into the United Kingdom it has been decided by the government to introduce Biometric Passports - or Identity Cards - which will make it easier to identity yourself and also make it harder for identity fraudsters to use your identity for purposes of obtaining money and goods by deception. A Biometric passport is a plastic card which contains not only a picture of what you look like but also detailed information on fingerprints and irises. In other words this card can store your fingerprints and blueprint of your unique irises which can be read by biometric readers thus identifying you as the card's owner. The idea behind storing such information used to be the stuff of science fiction but in recent years has become science fact and now the British government are forging ahead with the introduction of such cards by 2012 in order to reduce the number of cases of identity theft and also accurately count the number of legalised citizens within the confines of it's geographical borders. The hope is that such a Biometric passport - which will be both plastic card and also paper backup copy - will be acceptable in all countries and also make travelling considerably less stressful than it can be at the moment. Your biographical footprint is basically a potted history of your life including name, address, date of birth and National Insurance number. This information is also stored on a Biometric Passport and is collected by using government databases and also asking you to visit your local Passport Office in order to confirm identity thus making it harder for the identity thieves to forge. How Do I Get a Biometric Passport? A Biometric Passport will automatically be issued to you when you reapply or apply for the first time for an adult passport. This credit card sized card - which as we have already mentioned contains an image of what you look like - will be sent to you along with your passport under secured delivery. Again this is designed to reduce the risk of being lost, stolen or tampered with. At present the government are allowing those individuals who wish to opt out of the scheme to do this and anyone can opt out up to the 1st of January 2010: after which time it will be mandatory for everyone applying for a passport to have a Biometric Passport as well. What Will Be Visible on the Card? Your photograph and basic details such as name, address and Date of Birth will be all that will be visible on the new Biometric Passports when they are issued. Although these cards also store fingerprint and iris information this information will not be visible and only government institutions and retailers opting into the scheme will have the relevant equipment necessary to read the information permanently embedded on the cards. Can Biometric Passports Be Forged? At the minute it is hard to say yes or no to this question but experts say it will be extremely difficult to forge such cards. As the information contained on them will be already securely kept on databases overseen by the government it is thought that fingerprint and iris information not already stored on such databases will show up as being false with relative ease. 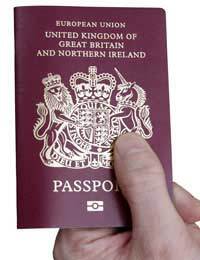 For more information you should contact your local Identity and Passport Service office or visit their website.